A three-quarters majority of the population (74 %) has confidence in the Czech army. A somewhat lower proportion of citizens, although still a majority, trust the police force (61 %). The current survey indicates that levels of trust are among the highest since the early 90s when STEM started conducting its long-term series of surveys. The survey cited here was conducted by the STEM non-profit institute (www.stem.cz) on a representative sample of the Czech population aged 18 and over from 11 to 23 January 2017. Respondents were selected using a quota sampling method, with some 1,048 people taking part in the survey. Since the beginning of the nineties, STEM has been monitoring the extent to which Czech citizens have confidence in the Czech military and police force. According to the most recent survey conducted in January of this year, three-quarters of citizens trust the military and three-fifths trust the Czech police force. During the nineties trust in the Czech army remained slightly below the 50 % mark. We recorded a significant increase in trust in the military in 2002 when almost four-fifths of respondents expressed their confidence in the Czech army (the survey was conducted in September 2002 during what was an exceptional time in the immediate aftermath of the devastating floods that hit the country in August). A year later, however, trust in the army fell by 25 percentage points, returning to its pre-2002 level. Since 2005 the level of confidence in the army has remained in and around the 70% mark. The slight decline in confidence recorded in September 2015 and in January 2016 was not confirmed in the current data. Leaving aside the extreme fluctuation recorded after the floods of 2002, the current level of trust in the army represents a long-term high. Since the beginning of the nineties, the data from STEM surveys has revealed that after regime change in 1989, it was not easy for the Czech police force to convince citizens of its credibility (again with the exception of the specific situation after the floods in 2002). However, since 2005 we have seen a gradual steady growth in the level of confidence in the Czech police. 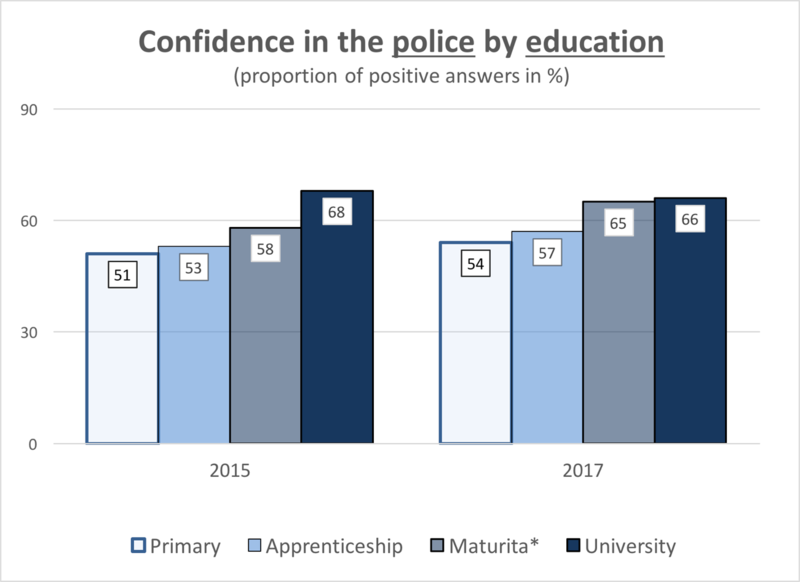 As in the case of the military, aside from the fluctuation in 2002, the level of confidence in the police is at its highest point in the time period under scrutiny (albeit only by one percentage point compared to 2015). 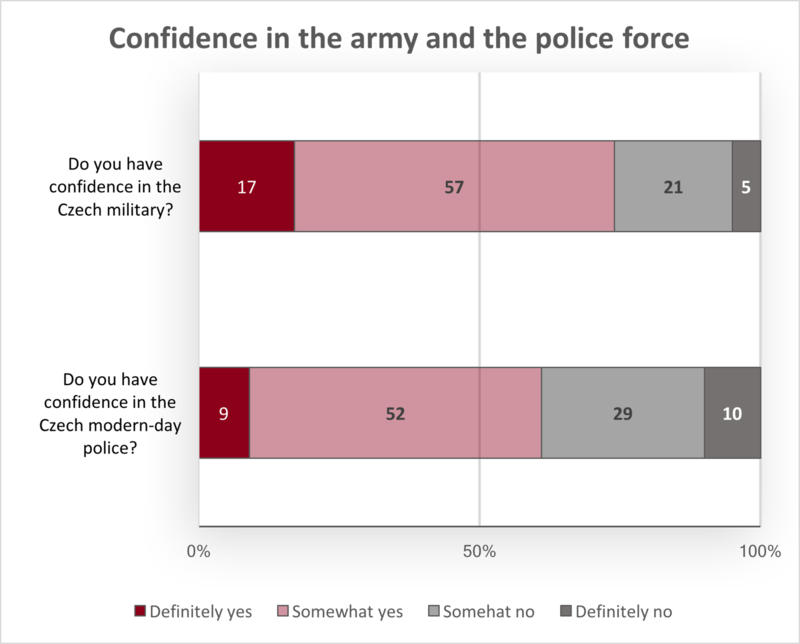 Opinions on the military and the police are interconnected, with over half the population (55%) expressing confidence in both forces. On the contrary, one fifth (20 %) of citizens trust neither the army nor the police force. However, one quarter of the public makes a distinction between the two security forces which essentially means that one-fifth (19 %) of respondents only have confidence in the military and 6 % only trust the police force. There is an interesting correlation between confidence in the army and in the police and the way in which the public rate the two ministers who hold responsibility for the security forces. 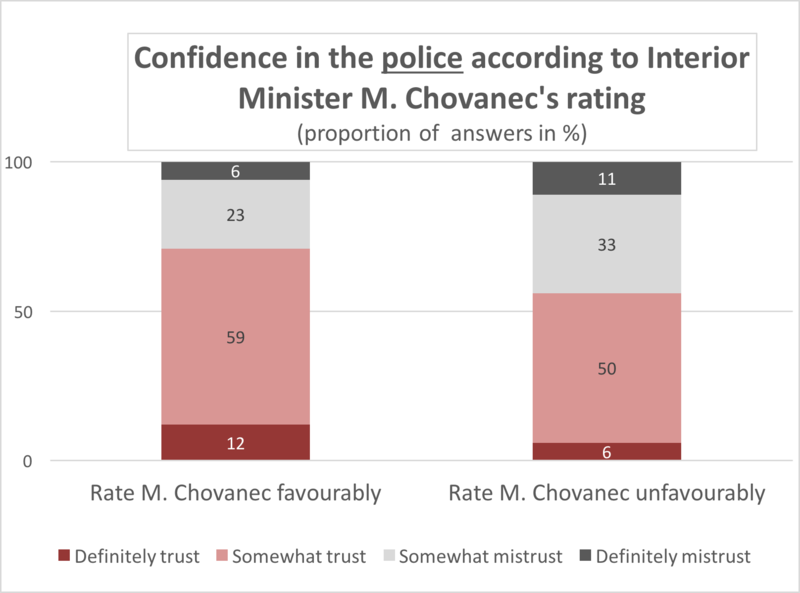 Some 71% of those who have a favourable opinion of Interior Minister Milan Chovanec trust the police, whereas only 56% of those who rate the minister negatively have confidence in the police. 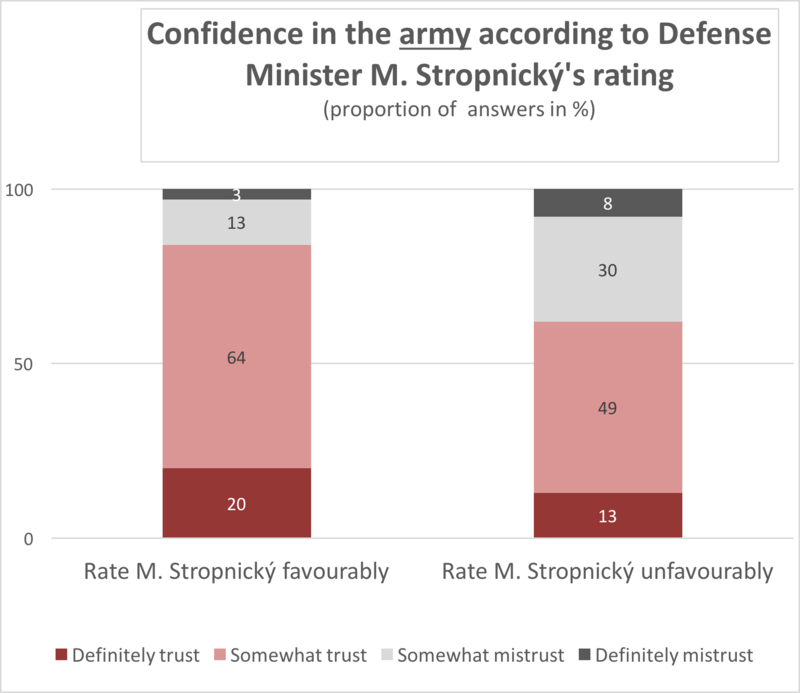 The same is true in the case of Defense Minister Martin Stropnický, with 84% of those who rate him positively indicating a higher level of confidence in the army, as compared to 62% of respondents who view him negatively. Confidence in the security forces is also significantly determined by education. People with a secondary or university education tend more often to have confidence in the army and police (the differences are more pronounced in the case of the police). 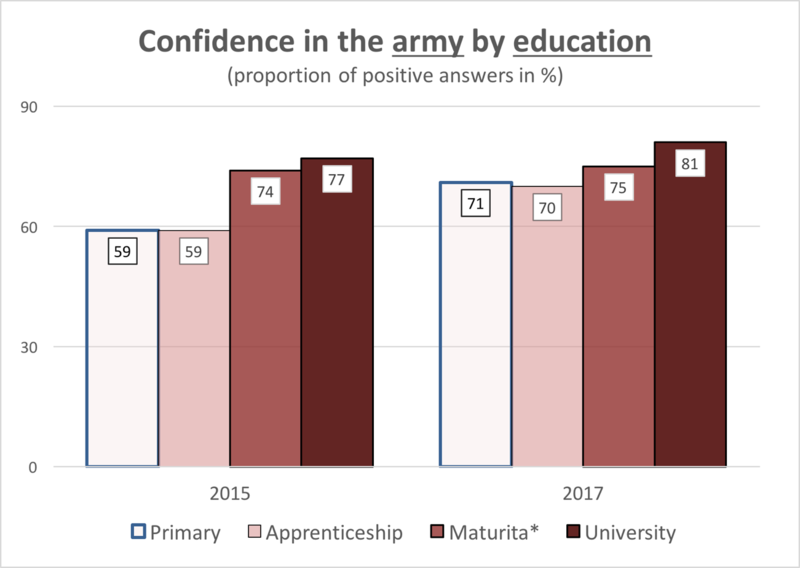 It is interesting to note that since 2015 differences in the public’s assessment of the army in terms of level of education have significantly declined. This means that confidence in the army has increased primarily among people with a lower level of education.